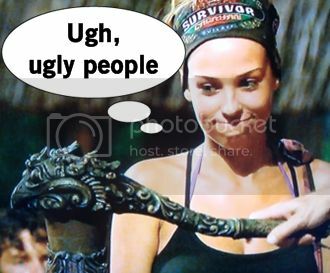 Given the shitshow of the latest tribal, there's some hostility at camp. Kass is happy that 1. she flipped, 2. she's a free agent, and 3. two buff dudes played their idol. Kass' former alliance is pretty ticked off, despite the amusing Tribal Council that had us all talking for days. Spencer is the most vocal because he can't hide his emotions at all, flying off the handle. But the next morning it Morgan is residually pissy, but I guess she always is we simply never see her because she's so dull. Kass compares Morgan to a nearly dead dog who just lays around and you let it live. Morgan's like "She probably hates me because I'm cuter," the most irritating defense ever of people who think they're so hot. Tony and Trish think they've got Kass on their side, but I'd be worried about her flip-flopping nature. This week there's a reward challenge where two teams race through a water obstacle course to retrieve a chest, which they drag and then open to solve a puzzle. The reward is a Survivor-themed Outback Steakhouse feast with steak, baked potatoes, s'mores, and pineapple margaritas. I have to say, I'm actually delighted to have an obvious product placement and sponsor. It harks back to the days of shellin' Mountain Dew and this makes me nostalgic. Now more importantly, will there be a Bloomin' Onion and that bomb pumpernickel bread? The orange team wins because LJ slaughters puzzles. LJ, Morgan, Spencer, Jeremiah, and Jefra arrive at the Outback Steakhouse on the beach, but thankfully the waitstaff doesn't sit at the table with you to make awkward ordering small talk. And it's the best food they've ever had because they've been starving themselves. When Spencer goes to wipe his hands after a savage s'more binge, he ends up finding a hidden immunity idol clue in his napkin. As soon as they return to camp, despite the rain, Spencer heads into the woods to read his clue and hunt for his new idol. Woo follows Spencer into the woods using his "ninja stealth mode" to find out what he's up to, noticing Spencer's khakis laying by the water. Woo eventually pops out of the trees, makes quick convo, then snags Spencer's idol clue and bolts - BRILLIANT! Woo gets LJ to start searching, then Spencer corrals his tribe to claim the idol. It's pure chaos. After telling Spencer it was karma for Woo to steal the clue from him, Spencer finds the idol right in front of an oblivious Kass. Oh Kass, you ding dong. The Immunity Challenge this week is to balance while balancing a block on their head that's wedged to a top bar. It's kind of painful and irritating, really just a battle of willpower and endurance. I appreciate their perseverance but it's boring to watch. 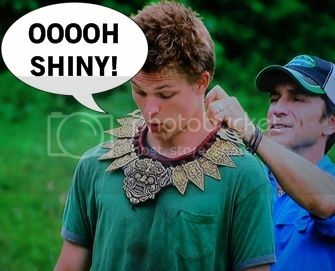 In a final two battle of Tasha and Spencer, it's Spencer's week as he wins immunity. Kass doesn't think the other alliance has an idol, so Tony and his crew try to come up with a plan "A" which is easy: Morgan. Their thinking is no one would play an idol on Morgan, because what a waste. However the concern is "chaos" Kass again, because she's a known flipper with no real loyalties. Spencer knows that a move is possible if they can convince Kass to flip again and take out someone on the other side (Tony). Kass knew Spencer would come crawling back. Her "free agent" gameplay is so irritating to me, eventhough I often hate the lemming idea of alliances. I think it's Kass' general attitude about everything and her arrogance. I'm so Survivor emotional, guys. Tribal Council time! Sarah arrives as the first jury member, and then Probst starts probing. Kass brings up how she got shunned and raged at three days ago for the hell she started by flipping. Spencer feels bad for his rage, but is glad he has immunity. Tony explains they're voting based on strength, ability to disrupt alliances, etc. and Morgan's like "Oh well that's not me." And Trish agrees and reminds Morgan that she's lazy and does nothing at camp. Morgan acts all cute and is used to life being easy for her because of her looks and seriously, I want to gag. And not the fabulous "gagging on your eleganza" RuPaul style. 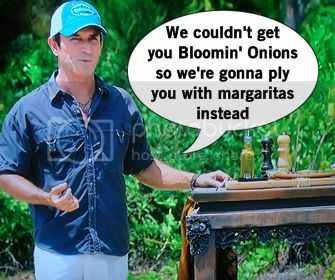 Tony and Spencer get into a little spat about their alliances which were formed based on merge shuffle, but Tony's relying too much on Kass - who even Probst points out is a flip flopping disaster. The votes are cast, no idol is played, and Morgan and her jugs are out of the game.